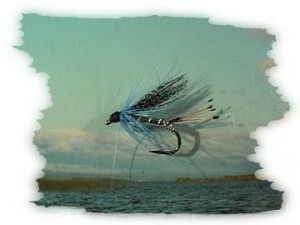 This is one of these traditionals which attract sea trout as well as salmon and in smaller sizes early season brown trout. It catches perch and pike; so here is a real all-round fly for predators, resembling herring fry, sprat or other small fish. Hook sizes vary from 4 or 6 to 10 for salmon and sea trout, down to 14 for brown trout. After a short moment of contemplation I decided to spend one or two of my yellow leisure-chips. Each of these coin like gadgets entitles me to utilise the conveniences of any official leisure-centre for two and a half hours. The plotter-chip B8 is inserted, the screen in my PACE ( that's the abbreviation for Passenger Cell ) shows the appropriate map. I pick the co-ordinates C9, F17 and P11 by simply pressing the H and D buttons and the mobile begins to move. While the PACE approaches the leisure-centre I think about that programme I had on the Muteco ( that is what we call the multi-tele-communicator for short ) the other night; it was really weird to experience that manual steering through the traffic, they had so called tyres attached to their boxes which made real contact with the ground. Gravityalteration was completely unknown to them, and how often you had to stop to get energy for your thing, petrol it was called. Enriched hydrogen, Lighttransformation or Particlestorage wasn't even dreamt of at that time; really poor buggers they were. But thanks to the Creator we've come a long way since, left the dark ages behind. Target point C9, F17, P11; Buoy-Art-Centre reached; you occupy space 1321, the car computer informs me via his Aura-Set-System. I just press the P-button and the printer ejects my chip with the space number on it, I don't want to memorise it. When I insert the chip later into one of the service columns, luminous arrows will guide me exactly back to my PACE. The lift is just around the corner and after I press an FP-button we glide up. Now I put one of my yellow chips into the slot under the I-light and the elevator doors open. I go now into the gear floor, there are vending machines here, where you can hire or buy your tackle. Some people like to bring their own, but I just like it the easy way. So, I put a brown user-chip into one of the machines and get my H18 rod with integrated reel, fly-tape-tube ( Flytt we use to call it ), Superfisyl as cast material and a landing net; that's basically all you need. Pocket knife, spare Superfisyl are things I carry anyway. Now I open the next door, that's the white AD-Door and in front of me is a splendid river landscape. The walls are actually giant flat screens. The theme today is: Intact Alpine Mountain Landscape. Well, that's what the Infomonitor tells me, and that I am angler No. 14 today. The river itself, a circulation plant makes it flow, has a stock of real trout and grayling. There is a hatchery in the storey below and the computer puts new fish in every day. Completely at random, regarding sizes and numbers. Water-temperatures are a constant 13.5 C, throughout the system, for maximum growth. Like I said; a coincidence-factor is used here, concerning size and amounts, so you can really hit a bad day, when nothing much goes, like in them olden days. The whole plant is absolutely realistic. This place closes from 4 to 6 in the morning, during that period every fish in the river is caught ( an electronic fish catching facility is installed all along the river-bed ) and put back according to size and species into the storage tanks below. They get a rest there for a couple of days; nobody wants to catch exhausted or lame fish. The river water gets processed as well at regular intervals. I think they have 6 or seven sets; mineral-and nutrient-enrichment, that's what they call it. There is a hatchery for insects, water-beetles and things like that as well. The entire operation is of course fully automated. I can fish on two levels and the stretch is 2.8 km long; with two falls, three shallow bits and lots of nice pools. We have a three meter wide shoulder, consisting of real grass, and they don't even cut it. You are supposed to stand on that grass when fishing, that's a sort of unwritten law here, etiquette, whatever you want to call it. The trees and shrubs of course are not real, it would be to complicated to move or remove them when they change the theme. According to the Infomonitor, next week we will get a 19. century Scottish River landscape. They will have salmon and sea trout in the water then. Must save a leisure chip for that, I'm sure that'll be great. I mosey on over to observation camera A, stand in front of that red line for three seconds ( without any form of headgear ), state clearly name and citizen-number. An Infrared light scans my face, they do that as a countercheck. That's basically all you have to do, to get your two and a half hours of first class fishing. Should I decide to stay longer, I can always put another yellow chip into any of the service columns. My Flytt is an assortment of 25 flies, I pick one of those supposedly old patterns, heard it goes back a very long way; twentieth century. At that time they made them one by one from natural materials like feathers, wool, stuff like that, somehow tied together with a bit of silk. Really primitive actually. Of course they are fully synthetic and move-active now. We've really left the dark ages. and thank God I wake up.